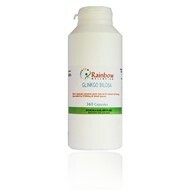 Ginkgo is considered to halt lipid peroxidation in the brain and protect the membranes of brain cells. It is possible that it could benefit sufferers of degenerative diseases such as dementia in the elderly. Studies have shown that ginkgo biloba can benefit senility and sufferers of Alzheimer's disease, and also help to improve short-term memory loss. Each capsule contains 100% Pure High Quality Ginkgo extract and natural ginkgo leaf equivalent to 5100mg with no additives or fillers of any kind.